4 bedrooms w/ 4 private bathrooms, sleeps up to 14...Enjoy a unique western paradise! This spectacular 5,600 sq.ft. Mountain Lodge sits on 87 private acres just a few feet from the banks of the South Fork of the Shoshone River near Cody, Wyoming. The property has a well-stocked trout pond and a quarter mile of premium fly fishing riverfront. Enjoy exclusive mountain views with remote wilderness areas in all directions. The property is also located near the popular back country and hunting thoroughfare. The lodge offers high-end touches that include ceramic tile floors with radiant heat, massive log beams and an impressive Great Room with a large river rock fireplace. There are four bedrooms with four private bathrooms. The master suite has a jetted tub and separate shower, walk in closets and French doors opening to a deck over-looking the river - and it's close enough to cast your fly from it! The basement family room has twin-sized bunk bed, and two futons for additional sleeping. The Great Room features a gourmet kitchen with plenty of counter space (seating for 12) and a dining room table well-suited for entertaining large parties. It is fully equipped with a refrigerator, coffee pot, freezer, gas range, wall oven, microwave and walk-in pantry. The downstairs provides a great escape - if you need to burn some energy head to the game room or relax by watching movies on the big screen TV. An additional full kitchenadd to the downstairs privacy. There are three separate patio areas where you can relax and enjoy the stunning mountain and river views. Abundant wildlife and ready access to National Forest land ensure hunting, fishing, hiking, equestrian adventures, mountain climbing and more during your stay. Cody's city center is only 33 miles away and offers cultural and entertainment attractions including a world-class rodeo every evening during the Summer. Unobstructed views of the mountains and river bring together family, friends, wilderness, privacy and the relaxed western lifestyle. This location is one of the most unique places in the world; it is the eastern gateway to Yellowstone National Park and a small western town with a friendly attitude! Once you are here you will not want to leave - and you will come back! 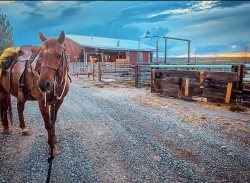 Enjoy the peace and quiet of this secluded ranch or check out the numerous recreation opportunities. The possibilities are endless! Sandi and her team are AMAZING. They accommodate and definitely keep in touch with their clients. This is the best property to stay at if you want to be in the mountains, you are surrounded by nature, wildllife, and the best view possible. The home is above and beyond what the pictures show. It was a very good experience working with members of your team. Everyone was very pleasant and accommodating. It was very pleasant and relaxing. Outstanding service and communication from the Cody Lodging Co. Would gladly book through them again in the future. What an amazing trip! So many family memories made in this beautifully well appointed home we can't wait for the opportunity to go back again in the future! Fishing, homemade meals in the beautiful well stocked kitchen, immediate and easy river access for the adults and equally easy access to the pond for the kids to fish in, Yellowstone National Park, the famous Cody Rodeo, seeing the wildlife right on the property to include deer, moose, elk, antelope, and yes, even a black bear right down the road! Absolutely loved this place and already miss it! Your team was excellent to work with. All 12 of us had a great time. Any one of us twelve would have a difficult time selecting a favorite feature. Collectively, the view with the river and mountains would be on each person's list, as well as the location of the river for fly fishing. Your team was so friendly and helpful! I talked to Sandi a couple times on the phone and she was great. You made us feel very comfortable with the arrangements. Check-in and check-out was a breeze. Thank you!! On a scale of 1-10, our visit was 10+. My only advice to people contemplating a visit is to not overbook your time with activities. If you have your heart set on doing a lot of activities in the area, book a longer stay or choose a location closer to town. You will be sorry if you don't allow plenty of down time to just BE in all this beauty. Wow...where to begin? The house is spacious and lovely and well appointed. We loved all the wonderful decorating details, especially the light fixtures! But as wonderful as the house was, it could not compare to the outdoors. The views in every direction were jaw-dropping gorgeous. We loved watching the wildlife, especially in the morning and evening. Within a close proximity of the house, we saw moose, elk, deer, bald eagles, a beaver and lots of beautiful birds. We also saw a bear, but at a comforting distance! For city folks, the beauty of the night sky is also a real treat. Who knew there were so many stars?? Perhaps our favorite feature of the house was the trout pond. Our crew spent many happy hours there, from young to old. We held a fishing derby that proved to be a great family memory! We've already told about 20 people about this place and how great our stay was. Thank you so much for helping our family have a vacation we'll remember forever and be talking about for years- we talked about it and all 4 families agreed - best vacation rental we've ever been in - better than Beaver Creek, better than Destin, just breathtaking views all day long far exceeded our expectations. The attention to detail in this home is fantastic- build quality is outstanding, from the custom fixtures which each tell a story down to the tight corners on all the custom woodwork - everything was so excellent inside the home. Then you take a look outside and every direction, every time the sun comes out or a cloud goes by, the lighting changes the view of the valley & the mountains- such a wonderful place. We loved it. When we called for a minor service issue it was responded to very promptly and the maintenance guy even though we didn't meet him called and made arrangement quickly. All was taken care of very professionally. Sandi was great helping to explain the area and give us more information. The property is documented well on line and just what they were advertising. Thank you for being so accommodating. Our stay was wonderful. While only a family of 4 staying there, the property is large and yet very comfortable. We LOVED watching the cattle graze, the views of the mountains are amazing everywhere in the house and the sound of the river just can lull you to sleep. We enjoyed driving farther into the canyon and enjoyed watching a herd of Elk in the field and listening to them bugle to each other was amazing. We also were fortunate to see some Big Horn Sheep by the road and babies that were fun. We even ran across a Grizzly in the river farther up that was playing on a hay bail by the waters edge. Oh my .. too funny. We fly fished in the river and caught some fish, and had fun in the trout pond as well catching several good sized trout there. The place was clean and had all that we needed to be very comfortable. We had a cold stay there, in Sept, it snowed and wasn't more than 38 degrees but we were cozy and happy in our home away from home. Cody is about 50 minutes but after doing the drive a couple of times, we enjoyed the views always and wasn't a big deal. Thank you for making our little family get away so special!!! Any questions or requests were handled immediately. We never had any issues and hated to leave. We had a great vacation celebrating the 50th wedding anniversary of my in-laws with the entire family. There were 13 of us, and it never seemed crowded at all. The views were amazing, and the grandkids all enjoyed the fish pond. Going into town is a bit of a trek, but so worth the amazing views. I hope we are able to visit again someday. It was a fairytale vacation We are already planning to come back again in the spring. - A lodging tax is assessed on your rent rate. - A cleaning fee is charged based on the size of the unit. - A $39 security deposit provides $3,000 in damage protection during your stay. You may decline this charge, but will be assessed a minimum $250 refundable deposit.